If your luggage is lost, we may have direct communication with the airline to help you get your belongings or compensation. 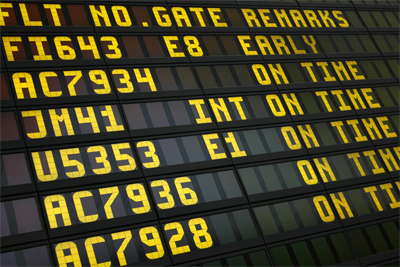 Sometimes the flight schedule is changed and passengers are not informed unless they have hired a professional agency. Why risk missing your flight even if you arrived on time? When your agent finds out about a last minute airline schedule change, he/she will call you even on their day off to make sure you are aware. In the case of missing a flight, we will fight to remove or decrease any penalties, or work on getting you accommodated. We’re experienced, we’re on your side, and we'll work to your benefit. The Internet may be cheaper, but it does not have the personal touch of supporting you in the case of a problem. Traveling matters are important and expensive, and are worth hiring a representative to assist you with. Call us as soon as possible to get your preferred dates, prices, airline, and seating. The longer you wait, the less chance you will have of getting your preferences. Click here to contact us or call us at (714) 491-0781. I've personally traveled on Turkish Airlines and experienced touring Istanbul, and would recommend this offer from my amazing experience. Also, the cruises, tours, and shopping are very reasonably priced. Be sure to visit the gift shops for Turkish delight, ceramic artwork, jewelry, scarves, traditional wear, and cotton garments. Please call soon for your preferred seats & prices to the Middle East, Europe, Asia, & the Far East, via Turkey, where you can discover the history of where East joins West.